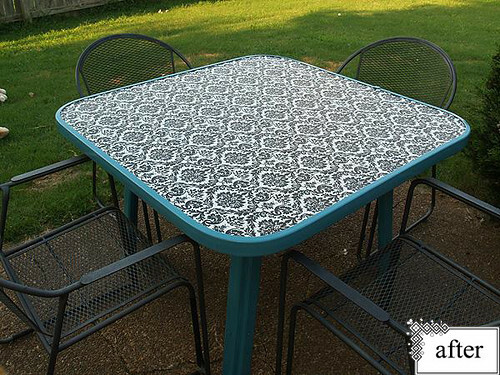 This week's Project ReStyle is brought to us by the fabulous miss Keiko Lynn. 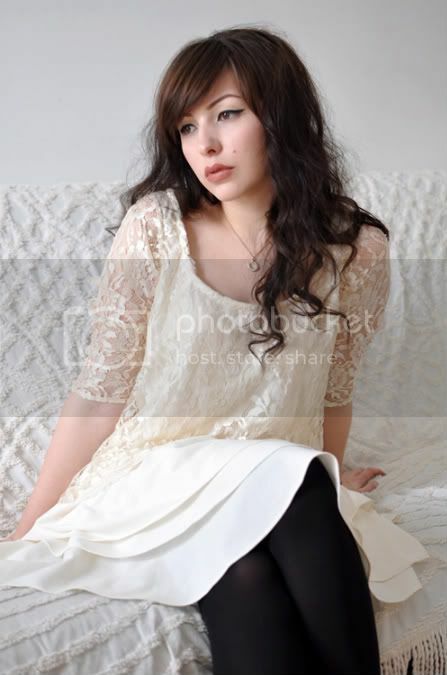 I love how she completely restyled this matronly lace dress. I can imagine it was a mother-of-the-bride dress from 1985! It looks stunning now and makes me want to go out and find one of my own! Here's what I did: I started by removing the sleeves and discarding the shoulder pads and rose that was sewn at the hip. I knew I wanted it to have sleeves, so I shortened them (at the top, to avoid extra hemming) to my liking. 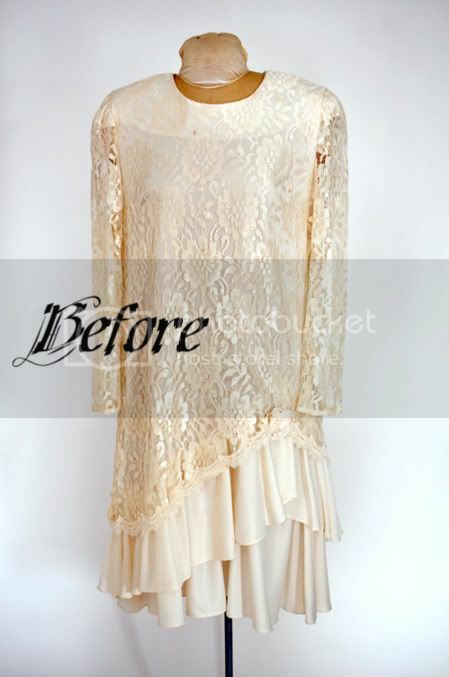 I had to get rid of the top of the dress, because there were several rust stains. I cut off the damaged area and worked from there. cutting new arm holes and a scoop neck. After putting the newly shortened sleeves back on, I hemmed the neckline - and it was finished! Originally, I was going to make an elastic casing for the waistline but decided against it, in favor of the trapeze cut. This way, I can wear it loose for a 60s mod feel or belt it for more definition. From start to finish, this project took me about 30 minutes - including threading the serger and sewing machine and winding a new bobbin. Plus, I was able to save a little old dress from its deathbed. Here are a few of my favorites from this week's Flickr group. 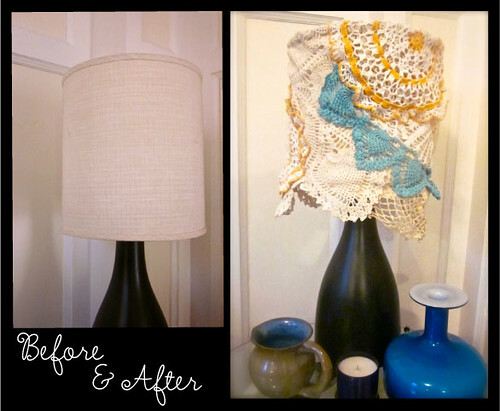 Doily lamp makeover by Margot. The after and the before by Sara Schmidle. These projects are great and there are so many more to fantastic ones in the Flickr group. I LOVE the way everyone is rethinking their stuff and making things new again. What have you been working on this lately? I've got about three more projects to tackle next week that I'm hoping to add to the Project ReStyle group myself. I love a good challenge and making things work in a new space is making me think hard! Really love the chairs and the table. I'm getting loads of inspiration from the Flickr group. You're right,it's just fabulous what people come up with. 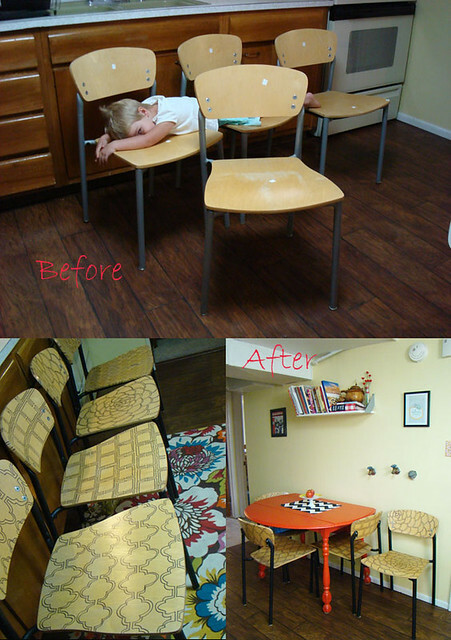 Thanks for featuring my chairs! And how i love that dress! Lovely dress! I find scrolling through the Flickr pool really inspring. 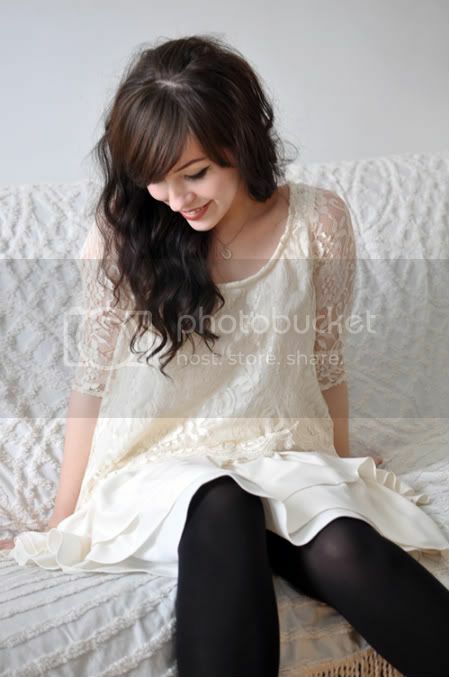 keiko lynn is very good at restyling clothes. she never ceases to impress me! what a transformation! but i'm really loving those chairs. i could use those chairs. ooooh those chairs are so inspiring.. honesty id never thought to use sharpie as the main drawing tool. im used to thinking in paint terms. how cool! cant wait to do something similar!!! wow, so many pretty transformations!! really love that dress - so impressive! What a beautiful transformation! I really like the simplicity of it - updated but not completely different from it's roots. Very nice! And the chairs? I just passed a stack of those at the thrift shop. Very tempted to go back and buy a few, but trying to remind myself that we don't really have the room. I love the chairs as well. So very clever and sharp looking. Alas all of my re-styles are still stuck in my head and on my to do list and it will be at least another month before I get to play along. the chairs and the table look GREAT! and i love keiko's dress!